The mist and grey skies have returned. As have the busy roads and factories. Onwards as fast as possible watching the death wishes of the mad Greek drivers. The English cycler we met today wasn’t enjoying his trip. James and I found it hard to say why he is doing it. While removing layers at a bus stop I spotted him. A long distance cyclist with lots of luggage. My squeal of excitement didn’t last long as he proceeded to cycle right past us. Later we saw him and heard all his misery. The whole trip sucked. He had cycled a big loop around Europe from Scandinavia to here. He didn’t ask where we were going. We are camped on a football field at the beach patrolled by a white cat. 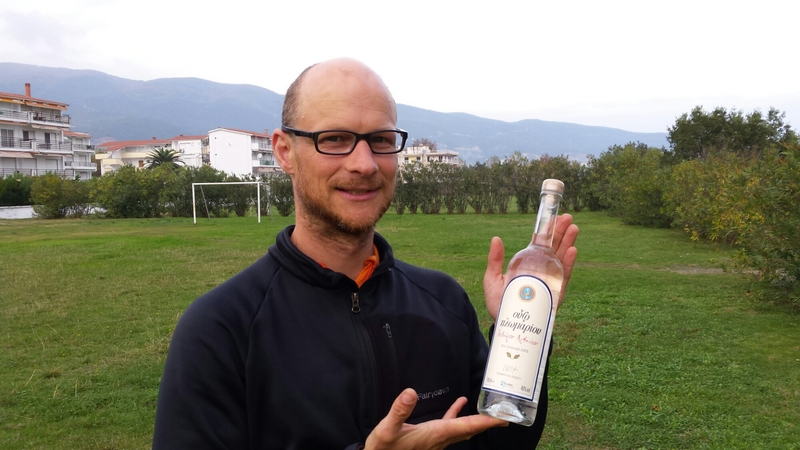 James revealed some ouzo, and then made a cake to celebrate his upcoming 6000km mark. If only i could contemplate you about the continuing bad luck with the weather in this part. Just a suggestion to keep in mind, from someone who has cycled the way you are – you are in a pivot point of your trip – leaving Europe and entering East. Modern Greece and Turkey are the places where the roots of civilization as known today developed. Do not rush, take your time with people, visit museums, cultural places, ask, learn, be open, see and hear. This can be a very interesting time that can mark your future. Thanks Giannis. We are slowly meandering through the countryside. At least we are now, after leaving the main road in Greece. 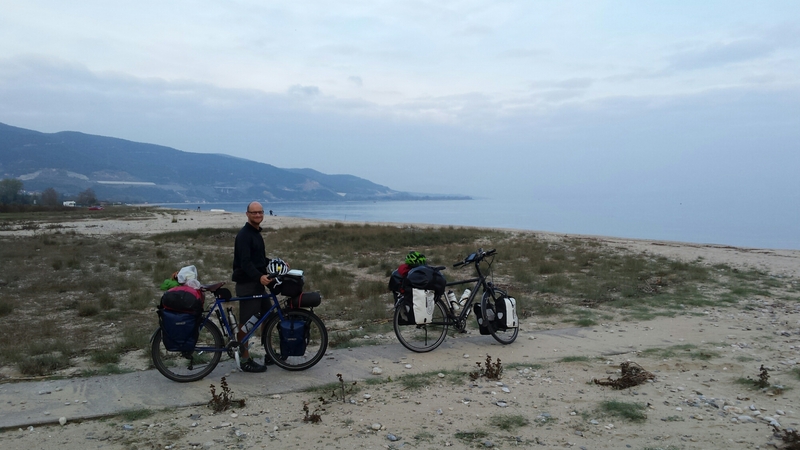 We are now in Bulgaria and will cycle through the mountains back to Greece and then Turkey. We stop and talk to people all the time and try the local delicacies. Ο τύπος πέρασε την Μακεδονία και δεν εμπνεύστηκε.μάλλον χρειάζεται καμια αυστραλέζικη έρημος και να πεθαινει της δειψας για να εμπνευστεί. I’m not planning to. I’m really enjoying myself. 🙂 The English cyclist we met wasn’t. I hope he is feeling better now. In spite of the weather, you seem to be doing well. I think that many of us are watching your journey and have developed a kind of kinship with you. I know I have. Hello to James! Thank you for your newsy upbeat updates, Matthew! 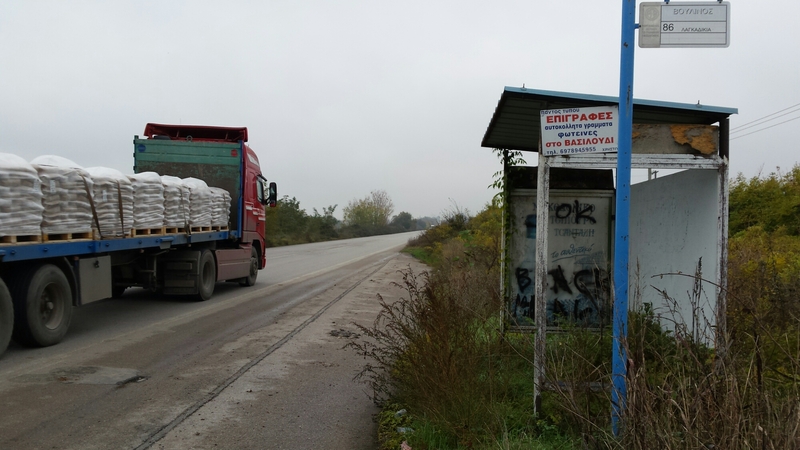 Greetings from Zlatograd in Bulgaria.